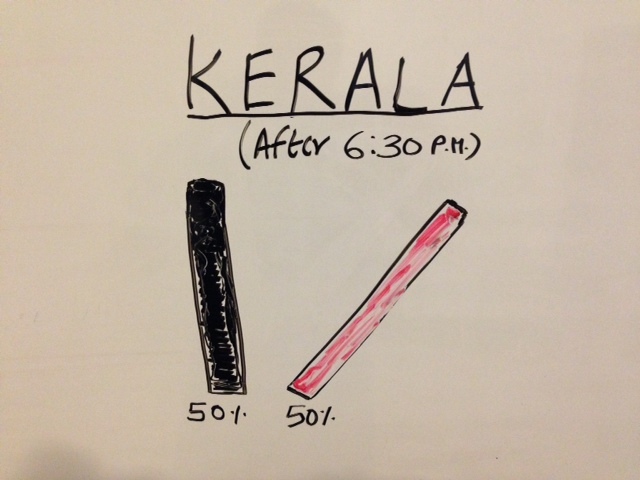 Life in Kerala after 6:30 p.m. Half of us prefer to walk straight, the rest are going…going…. I grew up in Kerala, India’s most literate, most beautiful, most cynical and most alcoholic state. Half of us walk straight after 6:30 p.m. while the rest prefer being slanted. Over the last few years, most of us prefer being slanted after getting drunk at exactly 6:30 p.m.
Why 6:30 p.m.? This is because a lot of us are jobless (three times the national average) and we have chosen a fixed time of the day to ask our friends about our next drink. Our own, patented and self-created happy hour begins at 6:30 p.m. and we are so knowledgeable that our conversations are not just about local happenings. We are the most literate in India that we can talk about the Middle East peace process better than the average American who would most likely think that Gaza is an exotic candy. In fact, we can advise Obama on how to solve Syria, deal with Netanyahu (who most of his countrymen won’t know) and help him fix most of the world’s biggest problems. All, for a drink after 6:30 p.m.
Just to clarify, we are not just the most literate, we are India’s most cynical as well. Our mornings are filled with rich content and on average, we religiously read three newspapers and watch over a dozen television channels giving us great insight on what’s happening in the world. We are a very literate society, too literate that we have forgotten to understand our own problems. So, you may ask what is our biggest problem? Well, after 6:30 p.m., a lot of our brothers and sisters have to get drunk. I mean, we think beer and wine are for babies. We prefer pure spirit (60% plus) and adore rum and brandy. In fact, a quarter of our State’s revenues (one billion dollars annually) comes from our methodical, disciplined and globally patented consumption of alcohol at 6:30 p.m.
We have made tourists so happy that we bring in more tourism in India than any other state. Our drunken state has created innovations in healthcare so much so that we have lots of hospitals focusing on one organ, the liver. Drinking is a family affair for us. Our children taste spirit when they are just over 13 and we beat the rest of India here too. Most Punjabi kids begin at 17, but being so literate we have to stay ahead of the game. In fact, we had a nine-year-old get so drunk from his dad’s whiskey that he finally died. I grew up in Kerala and I know a primary reason why the State loves alcohol. The climate, the culture and our exotic cuisine pairs up with any drink in the world. Moreover, we let pseudo-communists and pseudo-capitalists rule us every four years, keeping us in the same drunken state in Olympic years. Most of our youth are unemployed and they are pampered with remittances from the Persian Gulf or elsewhere. This inflow prompts us to spend on alcohol. And we love the world so much that we have to imitate the West and exceed their expectations on drinking. I was in Kerala in late June this year and struck up a conversation with a senior police officer. Within ten minutes, he opened up a half drunk bottle of rum saying that he was happy he got his morning fix. And, mind you, the sun had just risen. By 6:30 p.m. he would have gobbled at least six to ten shots as a warm up to his sunset in God’s own country. Irrespective of gender and social strata, Keralites have started taking to alcohol so much that hospitals are flooded with people facing health issues from grapes in their livers (cirrhosis) to depression and suicidal tendencies. Finally, our government has woken up and has started a phased ban on alcohol. Our media actively promotes it but after 6:30 p.m., sadly, most of our TV personalities who preach the ban can be seen in an underground dungeon of the Trivandrum Press Club sipping whiskey and club soda. Call us alcoholic. But we are the most beautiful, most literate…going…going…most slanted!